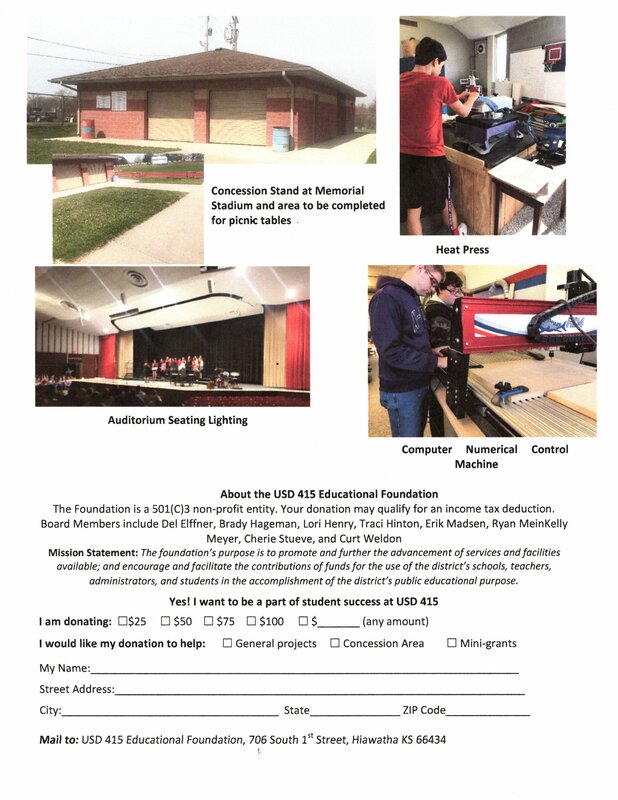 Through the generosity of the district’s alumni and patrons, as well as community members and businesses, the USD 415 Educational Foundation has been successful in providing funds for past and current district projects. Often, the money needed for these projects and materials isn’t provided thru local and state funding but is necessary to provide successful classrooms, educational experiences, and facility needs. Thru partnering with other organizations, such as the HHS Alumni Association, the Educational Foundation has been able to enhance student experiences at all grade levels, which leads to more successful and prepared students both now and in the future. Scholarships: The Educational Foundation helps to choose scholarship recipients for several scholarships offered to Hiawatha High School students.The Moore Trust has had very successful returns over the years, and the Foundation is able to award significant Moore Trust scholarships to every HHS student who is attending a 4-year college or university, a 2-year community college, or a Vo-tech or trade program. Successfully completed projects: The Educational Foundation has helped the district, thru donations and Foundation grants, to complete several projects over the years that have improved the learning environment and learning experiences of USD 415 students or have helped the district with facility improvements.These include the greenhouse for the Ag department, an updated and enlarged weight room at the high school, the concession stand and restroom building at the football stadium, the auditorium seating lighting, the purchase of a CNC (Computer Numerical Control) machine and laptop for the Industrial Arts department, chemistry equipment, and a heat press and embroidery machine for the Red Hawk Stop used to make T-shirts and sweatshirts, including designing and making this year’s Alumni Association 100 year celebration shirts. The Foundation has also helped teachers by providing mini-grants that have helped fund past educational field trips and Science Olympiad state competition trips, as well as other classroom needs. Ongoing projects: Currently the main fundraising project for the Educational Foundation is to help improve the area around the concession stand to help with drainage, traffic flow, and provide an area for eating. Last summer and fall, the district completely removed the nearly 30-year-old track and replaced it, giving the district one of the best track sites in the state.With this addition, Memorial Stadium is now a top-notch high school stadium.The Educational Foundation is helping to raise funds to concrete the area between the new building and the track and stands and add stationary picnic tables and trash cans to complete the project. Today, we are asking you to consider a donation to help with our on-going projects or any new projects that will arise. Your gift of $25, $50, $100 or more will help us to continue our much-needed donations to these important projects.We encourage you to share this information with your classmates, district patrons, community members and businesses thru email, Facebook, and at your upcoming alumni gatherings. We hope you will help support our students and community with your donation today.